That's the miracle of Riedel's extraordinary Vinum crystal stemware. Each glass is beautiful to behold, as soft as silk and a joy to drink from. Personalize with up to three initials. Imagine every bottle of wine you open tasting more delicious than ever before! That's the miracle of Riedel's extraordinary Vinum crystal stemware. Each glass is beautiful to behold, as soft as silk and a joy to drink from. Moreover, all machine made Vinum stems are completely dishwasher safe. This item ships directly from the manufacturer. Please allow 1-2 weeks for delivery. Select items will have additional shipping charges, please see above for this item's additional shipping charge. Michele and I (Mark) love to drink red wine and frequent many of the DC area restaurants. We have gotten to know many of the bartenders, sommelier and waiters, and they often refer to us as M&M, especially when we are introduced to someone new. Really happy with these wine glasses. 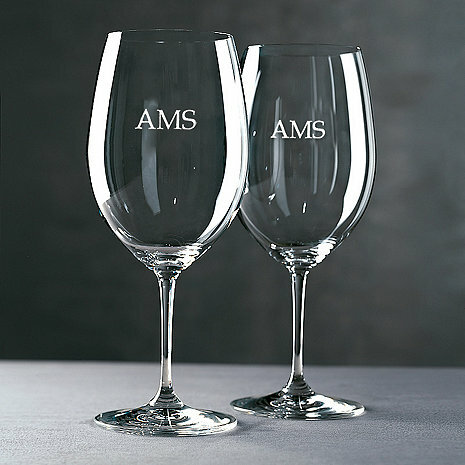 I had them personalized as a gift, the font is quite small but the glasses themselves are beautifully thin and delicate. Would purchase again! THE GLASSES ARE GREAT BUT THE MONOGRAM WAS NOT THE RIGHT LETTERS. MY WIFE ORDERED THESE AS REPLACEMENTS FOR SOME GLASSES THAT HAD BROKEN AND ASK THE REPRESENTATIVE IF SHE NEEDED THE OLD ORDER NUMBER TO MATCH THE MONOGRAM BUT SHE SAID NO THAT THEY HAD IT. THE GLASSES CAME IN WITH TOTALLY DIFFERENT MONOGRAM.